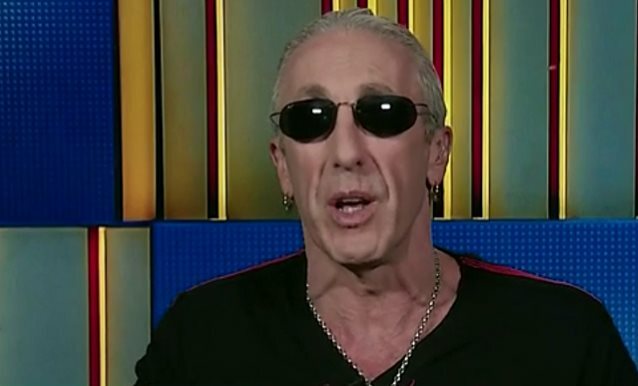 TWISTED SISTER singer Dee Snider has spoken to CNN about his decision to ask Republican presidential hopeful Donald Trump to stop using the band's signature anthem "We're Not Gonna Take It" as the "exit song" at the controversial politician's campaign stops. Snider — who knows Trump personally after appearing more than once on "The Celebrity Apprentice" — said (see video below): "Like many of us out there, we have great friends who we never discuss the big three with: sports, religion or politics. Because we know if this discussion breaks out, that's the end of the friendship. And I've got friends who I know have far different political opinions than I do." He continued: "When Donald started running for office, he asked me, he called me. He says, 'Can I use the song?' And he's a buddy. And I said, 'Yeah. Go ahead.' But as the months went on, I heard a litany of his beliefs that I'd never discussed with him. I finally called him and I said, 'Man, you've gotta stop using the song. People think I'm endorsing you here. I can't get behind a lot of what you're saying.' And that night… He has not used it since. He said, 'Dee, fair enough.' He's a friend. As a friend, he called me. As a friend, I called him, and he stopped using it. I still like him, but, man, I did not know some of the things that he believe in and stood for." Regarding whether there was a particular issue that he is not too cozy with that would make him go back on his decision to allow politicians like Trump to use the track, Snider told CBC Radio in a recent interview: "The first line of the song is: 'We've got the right to choose.' And that's where I draw the line. And that's really when… When a person wants to use the song who's against freedom of choice… And I don't know if Donald's hit that line yet; I haven't heard his views on being pro choice and abortion rights. I know where he used to stand. That's another thing… I just did a podcast on this: 'My Donald Trump versus the public Donald Trump.' And they're very different. My Donald Trump was a Democrat. My Donald Trump is pro choice. My Donald Trump is what they call Northeastern Republican — fiscally conservative but socially liberal. But that's changing." He continued: "The biggest thing about that song is it's about the right for people to choose for themselves. When it crosses that line, like Paul Ryan a number of years ago, who's as anti-pro-choice as you can get, I had to step up and say, 'Wait a minute. Didn't you vet the song? You're singing the song, 'We've got the right to choose',' and then railing against women's right to choose. So I can't endorse you using it.' And that's where I draw the line." Snider was fired by Trump on NBC's "The Celebrity Apprentice" in 2013.